Is there life without saffron? Maybe, for some cooks. But not for me. 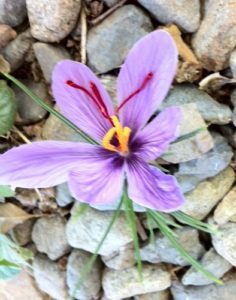 I’ve planted my own saffron crocuses, and from the several that bloomed (that’s one in the photo) over a couple of years I eked out enough stigmas to tint and flavor a handful of dishes—an ultra-clarified golden fish stock poured around a lozenge of poached halibut one Christmas eve sticks in my mind. I don’t make a saffron dish every day, of course, but often enough that I keep it on hand. Or, strive to—I’d actually been without for a while, making do with one-use purchases. Now, however, I have a forever saffron, from Rumi Spice, which I learned about from a most unlikely source, Shark Tank. It’s not that I don’t consume every single Shark Tank ep with single-minded concentration, I do—it’s just that I do not expect to glean a great cooking ingredient in so doing. 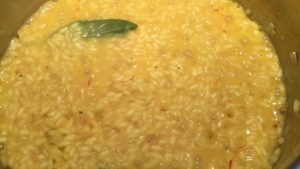 It’s especially gratifying that Rumi Spice saffron is the very best I’ve ever tasted and cooked with, because it has something else going for it: righteousness. And righteousness hasn’t really been a part of the story of the global spice trade through history, has it. The company was founded by U.S. veterans of the war in Afghanistan, looking to contribute in a meaningful way to the country in which they’d served, especially in a way benefiting Afghan women. Just a pinch of Rumi saffron threads tinted my risotto a deep, sunny, school-bus yellow—you can see in the photo—and had a round, savory flavor and aroma completely without the harsh, medicinal edge that instantly creates saffron-dislikers. So good! Convenient to order from the Rumi website or, as I did, from AMZN Prime. The price is so good, too: just $8.99 for half a gram, $14.99 for 1 g. I started with the half, but think I’ll be on the gram plan from here on in.